Sometimes I am in a mood where working at home just won’t work, because it is work I don’t want to do so I don’t. I find other chores to do instead. I will say that if I sit down and work, things do get done much faster at home than they would if I were in the office. Something about coworkers and distracting interruptions for conversations with people I really like vs. sitting home with only the cats. Friday? It’s ABOUT TIME! this has been rather a horrid week at work, with many long days and too many things due before the 1st. Ugh. But here it is, Friday, time for a list. Let me take a good look at the day and see what I can come up with. Oh, hey, here’s something – WORK! I still have to finish one last report. I hope to have it done by noon time. Working at home means it can happen, because I can sit on the couch with a fire and coffee and no coworkers who need things. And I can do laundry while I work. Woo hoo! Then I am off to Bangor for a car service appointment. If the report isn’t done, it goes with me. If it is – then the knitting goes with me. I would like to make serious progress on sock two. After the car is serviced, I get to go to the grocery store and pick up the makings for a delicious chocolate fondue for game night, which is tonight, also in Bangor. I have such fun playing board games with all the people A works with. More fun than she does, actually. Isn’t she good to me to go along with it? After the grocery store, I will head over to Best Buy with my gift card to see if they have some movies I want to own. And if, at that point, it is too early to go to game night, I will just have to entertain myself at some big box craft stores. How very sad! This weekend, I also plan to finish the big red sweater. the sleeve is flying along, and I only have a few more inches to go. then, I pick up and do the neckline. then, after I sew it together, I determine if I like how long it is, and how much yarn it would take to lengthen it, and I think that will lead me to picking up a mess of stitches around the bottom and designing a band to get me a couple of inches of length. We will see…. This weekend I also need to start the clean up in the craft room. I have too much stuff out. I need to put it away, clear out and file, and see what is left. It will take a long time, I won’t even pretend that I can do it in a day. But I can do a bit each weekend. Maybe not next weekend – just wait until next Friday when I tell you what my weekend is like. I am so tired of hearing the unthinking prattle of our local commentators on air. And, it seems, the national level ones are no better. Do they ever listen to themselves? They don’t even make sense! Really? And if I have been listening all hour, who are the guests? For the rest of you, it is a hot summer day. LISTEN UP! If.. then: what happens in the former has to have bearing on the latter or it makes no sense. Now, I have to confess, I have caught myself saying to the receptionist at work “If anyone is looking for me, I am going to lunch” which I usually catch instantly after it has left my mouth, so I add “And in fact, I am going to lunch even if no one is looking for me.” But I am not paid to talk endlessly. I think those who are should pay attention to what they say. Topics for another day? More pet peeves. oh-ho, Mother Nature, you messed up your calendar again! Of course, you realized it, and so tomorrow we will get more snow showers. Thanks a bunch. Yesterday went pretty much as planned, I drove all the way to Calais (100 miles through beautiful wilderness) and only was about half way there when I realized no passport, so – no chocolate. Very sad. The fundraiser was very well attended – we stayed until intermission, and I loved the music, although I could have done without the staged bantering that happened between acts. I’ll find out next week how much was raised, but it was close to $10,000 when we left. Not bad!!! I also could have done without the person near me who was doused in perfume – when we left I had watering eyes, a stuffed head and a sinus headache, and it wasn’t all because I am catching A’s cold. I (Finally) made my niece B her birthday card, it was a lot warmer in the craft room today, so I took advantage. The required glitter should be dry tomorrow so I will drop that in the mail to her. I stayed in bed late today, and read a whole novel – been a long time since I did that – Lisa Gardiner’s Touch and Go. Her stories are creepy scary but fast paced and good reading. I love that she has contests to name her victims after real people. I can’t think of anyone I want to kill off, so I have never entered. But it is fun to read about them in the notes. Author salpal1Posted on January 25, 2014 Categories how I plan to spend my day, what I am thinking about, What I readTags colds and flu, Ellsworth, knit, Lisa Gardiner, long week at work, winter weather3 Comments on Snow? On Saturday? Ahhh, Friday! I love’em. This one will be a bit strange – not only do I have to work, but I have to work far away. So I will get up a bit earlier than a normal work day, and head off to Calais (that’s Callous Maine, not Cal-ay France unfortunately) for a meeting that I HOPE will be done by lunch time. Should I bring my passport so I can cross into Canada and get some Ganong chocolate? Hmmm, maybe I should…. I don’t see much knitting in this day, but you never know. I will certainly have it with me. Sweater is coming along slowly – I have hit the long row section of the second shoulder area – so rows take a while to do. But I know it is only for a short time, and then I will bind off most of the stitches and race down the arm. It is REALLY thick and warm, I am going to love this sweater in weather like we are having right now. 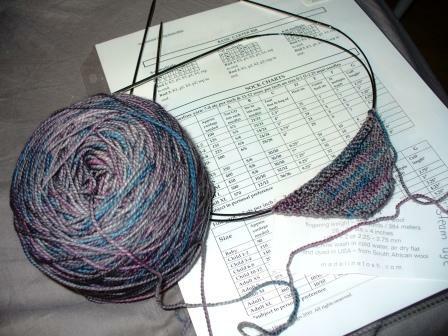 I think that basically I like this idea of knitting wrist to wrist, and that I will make up some patterns that don’t involve a cropped sweater in solid cables. The screened porch is showing great progress – when I got home tonight, the screens were up!!!!! I took Allie out to check it out. There is still no door, and the soffits are still open, so I didn’t want an adventurous, fast cat to go out with me for the first time. Allie is neither of those. She made herself as low to the ground as she could and raced back to the dining room door. I opened it, she scooted in and we were done. Probably a good thing as it is down around 0 out there. Two things require outside input. Neither is urgent, but if you have thoughts/ideas, please leave them in comments! 1.) What to do with small amounts of leftover sock yarn? No babies to knit for in our family. Other ideas? 2.) What should we see without fail in Charleston, SC??? We just booked the hotel last night (YEAH!!! ), and will be driving down in April. Staying for 5 nights, and that will translate to 4 full days there, with the possibility of a partial day on arrival. We are staying in the historic district, but other than looking around there and seeing Ft Sumter, I don’t know what is there. Have you been? What should we see? Where should we eat? Is there a LYS I should be on the lookout for? I’m trying to be better at posting from the camera. And better about taking photos of what I am doing. And better about not using the flash. But I have to confess, given the low light this time of year, the photo of the socks in progress with flash is a much closer representation than that without flash. This is the start of sock number 1 of the second pair of Socks With Sarah socks. The yarn is Madeline Tosh Tosh sock, color is steam age, and it is just so pretty – nice and soft, lots of color but not garish like my last pair! 🙂 The yarn itself is quite nice to work with, a 2 ply wool, with a nice twist, so it stays together. The pattern is Figheadh Fundamentals, more info on my Ravelry Project page. It is another toe-up sock, and I have to say – I like toe up – NO Kitchener! The cast on takes some getting used to, but it is a much nicer toe, I think, than any weaving I have ever managed. Heels turn essentially the same way, but no picking up stitches. Just turn a corner, keep going. Love it! Anyhow – I took this the night I cast them on, I am a bit farther along, a couple of inches down the foot, I would guess. So far so good at keeping to the KAL rule of working on them some every day, even if it is just half a round.